Bicycle Industry has its existence since decades when it was major means of personal transportation. With the advancement of technology, trend of bicycle was reduced in Europe for couple of decades, but its popularity is rebounding on account of the health priorities and environmental concerns to reduce CO2 emissions. The increasing urbanization, congestion and sustainability are majorly driving the rising demand for bicycles all over Europe. Moreover the distribution channel has fuelled the growth of European bicycle market such as in Germany, where sales through online distribution channel is rising at a steep rate. Whereas, sales through the bicycle specialty offline stores is continuously decreasing as registered during 2012-2017. Further, the trend of e-bikes is setting up ground for the growth of new and existing entrants, in particular e-performance mountain bikes being the blistering category going frontward on the road-race e-performance bikes. E-bikes are expected to contribute 45% value share by 2022 to the total bicycle market in Europe. Bicycles price range from low to very high price; the low and medium priced bicycles have major market share of 41.6% in 2017, which is largely catered by the online distribution channel such as Amazon. 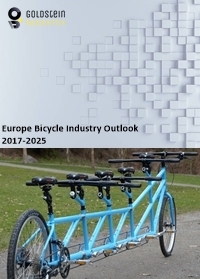 Goldstein Research analyst forecast that the Europe bicycle industry is set to reach USD 23.36 billion by 2024, growing at a CAGR of 5.61% over the forecast period (2017-2025). On-road bicycles segment accounted for largest market share of 32.4% in 2016 owing to the rising sales of bicycle for fitness and casual purpose rather than adventure and sports. Over the forecast period, e-bikes are expected to take over the market share, growing at a CAGR of 7.3% during 2017-2025. Based on geography, Netherland and Denmark accounted for largest market share of 37.1% in 2017 owing to the major contributors in the global urban cycling trips, which accounted for 6% of the urban trips worldwide. Netherland and Denmark is closely followed by Germany on the back of major manufacturer presence and it is expected to grow at a CAGR of 5.8% over the forecast period. The report covers the present ground scenario and the future growth prospects of the bicycle industry for 2017-2025 along with the industry players’ analysis. We calculated the industry size and revenue share on the basis of revenue generated from major players in the Europe region. Europe bicycle industry is forecasted on the basis of bicycle manufacturing and sales. European Bicycle Market report has been prepared based on an in-depth industry analysis from industry experts. The report covers the competitive landscape and current position of major players in the Europe bicycle industry space. The report also includes porter’s five force model, SWOT analysis, company profiling, business strategies of industry players and their business models. “Europe Bicycle Industry Report” also recognizes value chain analysis to understand the cost differentiation, pricing models to provide competitive advantage to the existing and new entry players. Our Europe bicycle industry report comprises of the following companies as the key players: Giant, Bianchi, Scott Sports SA, Cicli Pinarello S.p.A., Colnago Ernesto & C. S.r.l., Schwinn, Trek Bicycle Corporation, Cannondale Bicycle Corporation, GT Bike, Piaggio & Co. SpA, Atala spa, Accell Group, canyon bicycles, etc. India Bicycle Industry Analysis Report 2017-2025: Market Overview, Trends, Key Players, Development, Outlook, Competitive Analysis and Market Data Forecast.